Just in time for Halloween, AIA sees a Jack O'Lantern in the Sun! What an active region 12192 has been! Six X-class flares in 9 days. Here is an HMI image of AR 12192 at 1615 UTC on 23-Oct-2014. You can see a couple light bridges going across the sunspots. There are some partial bridges in the left hand sunspot. But no matter how hard I squint I can't see a jack-o-lantern. It will soon be lost to view as it rotates over the limb of the Sun. 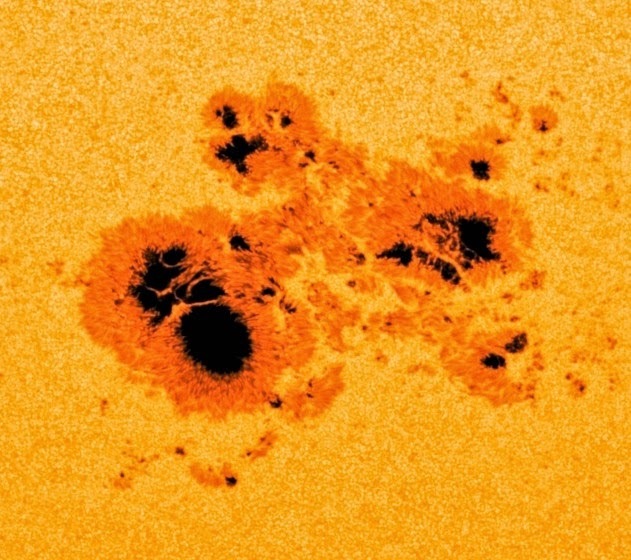 Large flares often (but not always) come from large active regions. How did AR 12192 rank in size among active regions? 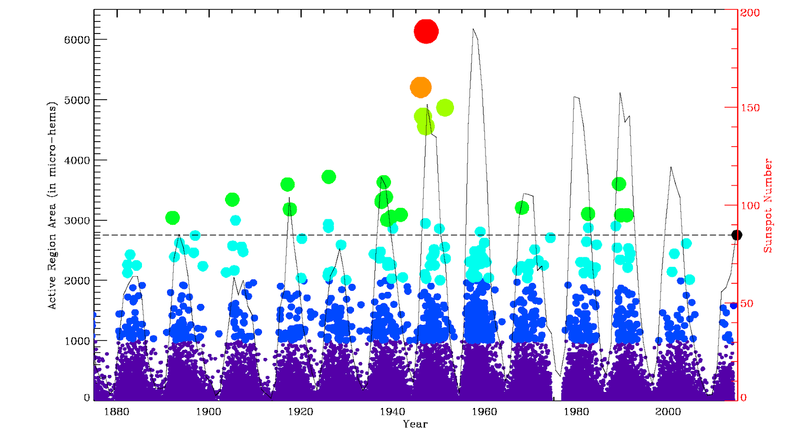 Here is the plot of maximum area of active regions in time. There are 32908 active regions in this plot. The color and symbol size changes as the area increases. AR 12192 is drawn as a black dot all the way at the right side of the plot. There is a dashed line drawn at 2750 micro-hems to help you compare this area with the others. From this we see that AR 12192 ranks 33rd in a list of active region sizes, not the biggest but in the top 0.1%. It is bracketed by AR 4497 on 08-Jan-1897 (2743 micro-hems) and AR 19109 on 08-Jan-1959 (2805 micro-hems). The area of the Earth is 83 micro-hems, meaning AR 12192 has an area of about 33 Earths. The yearly Sunspot Number is drawn as a red line. This allows you compare how the maximum area of active regions changes with the number of active regions. 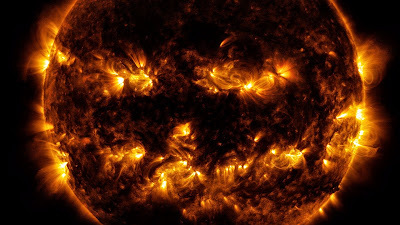 It was surprising that the largest active regions are not in Solar Cycle 19, which has the largest amplitude in Sunspot Number, but in Solar Cycle 18. The top 5 active regions appeared between 1946 and 1951. 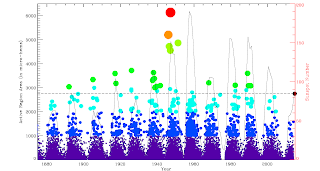 Solar Cycle 19 started in 1954. The next set of large active regions have areas of 3000-4000 micro-hems and are spread across many sunspot cycles. How big was the active region that was the site of the Carrington Flare? It was 2300 micro-hems, not even in the top 50! You can look it up on p. 102 of the table by Jones. The flare on 1-Sep-1859 has been estimated at X35, showing that large flares can come from medium-sized active regions. 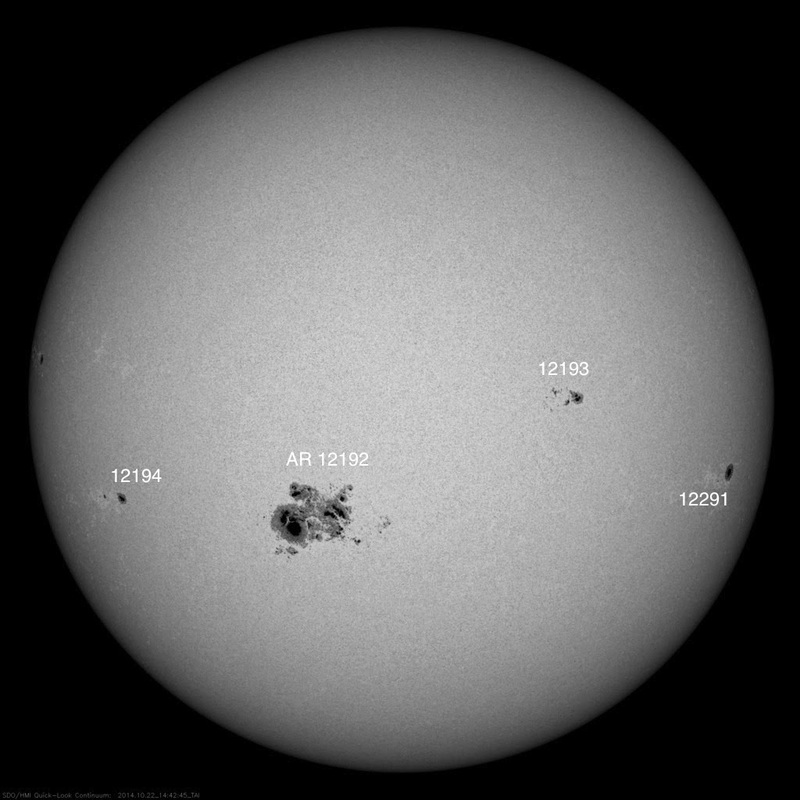 So long for now to AR 12192 but perhaps we will see you next rotation! This active region has caused a "Major Flare Watch" to be declared, so the two calibration maneuvers SDO had scheduled for today will be done in two weeks. Here is a summary of our projected activities for the rest of 2014.